Construction of the cathedral at Lausanne began in the year 1170. This magnificent pipe organ was inaugurated in 2003. 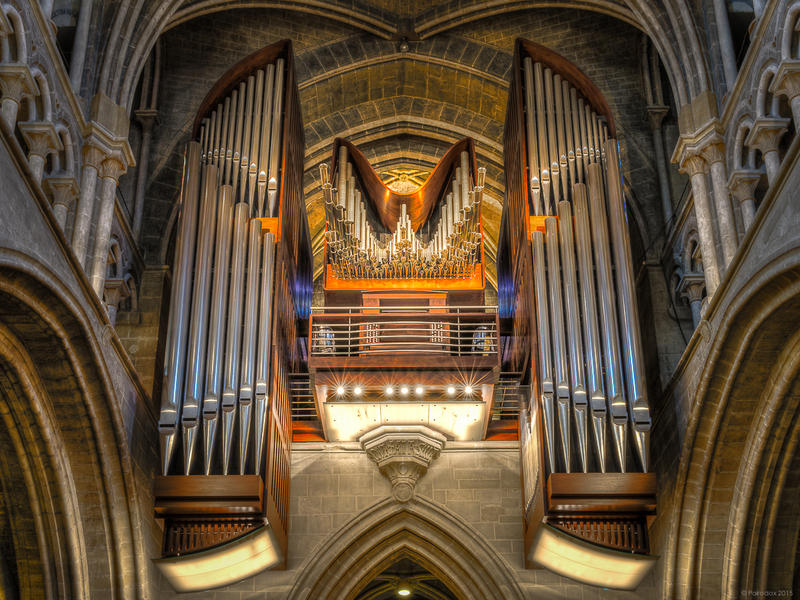 It is composed of 6737 pipes, required 60,000 hours to build, and is unusual in that it is the first organ to have been manufactured by an American company (C.B. Fisk‘s Opus 120) for a European cathedral. I intend to post a few other photos of this cathedral but thought that this particular view provided a good starting place. Joanna and I had spent the morning and early afternoon scouting the city for photographic fodder. When we entered the cathedral, the exterior of which I had captured the day before, I was like a kid in a candy store. There was so much potential, I tried to turn in all directions at once. My immediate thought was is it OK to take pictures here? Once I saw the sign which indicated that only flash photography was prohibited I went to work. I wondered what the others who walked the nave thought of the slightly deranged looking fellow, running about with a fully extended tripod, and dangling camera bag. I wondered whether they noticed when I dropped my lens cap, fumbled with my glasses, and searched my pockets for my wireless release and lens cloth. I began at one end of the nave for a view of the vaulted ceiling. Then to the other end to capture the ceiling again. Then to the chancel. Then one transept and the other. And back to the nave for additional long-views of the ceiling. When I reconnected with Joanna and prepared to depart the sacred space I stopped short to realize just that – I had been cavorting about in a sacred space for nearly an hour without stopping once to appreciate its significance. I paused to consider the fact that the glorious volume within which I had been scurrying had existed for more than eight centuries. Eight centuries! I was ashamed. What a gift to have been given the chance to experience such a place, solemn and reverent. A place which had seen so much human emotion. Then I wondered about those who had come to worship so many centuries ago, or yesterday. What fear, what joy did they bring as they stepped through the intricately carved doors? How were they dressed? Why had they come? Was their presence a matter of routine? Did they come to worship? Did they seek guidance or nothing more than the comfort of fellow parishioners? So much emotion, experienced alone and in the company of others. The volume could surely bear witness to the gamut of human feeling and for most of the time I walked the space I was unaware. Perhaps if I had stopped to listen I could have heard whispers, secrets which clung to the stones beneath my feet. I am sorry to have been carried away by the awesome beauty of the place. Perhaps in that way, by being carried away, I did pay my due respect?